8 March 2018 (FAO)* –– Agriculture plays a pivotal role in the lives of most Kenyans with close to 70 percent of the population – mainly women – relying on it. 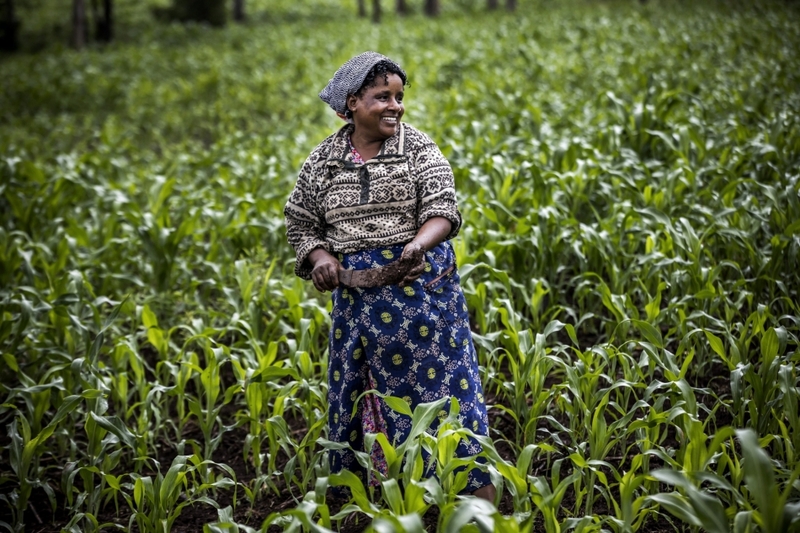 Yet Kenya’s agricultural potential has been low with productivity reported to be on a gradual decline, affecting families, particularly in the rural areas. Arid and semi-arid areas make up 80 percent of Kenya’s territory, yet their agricultural potential has not been fully utilised. FAO and the European Union are supporting small-scale women farmers to grow more food and earn more from their crops by adopting conservation agriculture (CA), and linking the farmers to the markets. Conservation agriculture: what is it and how is it helping Kenyan farmers? 48-year-old Lucy Kigunda is a member of Ithondio women’s group in Imenti North, Meru County, in the central region of Kenya. More recently, she has started planting sorghum, a grass species cultivated for its grain – used for consumption, animal feed and ethanol production. Its steam can be used as building material and its leaves for animal fodder. “Before we started planting, we put in practice what we learnt. It is important to rotate the crops and to keep some of the crop residues on the soil to retain the moisture and protect the soil. These new ways of working our land have improved our farming, and we now have a much better harvest,” says Lucy. 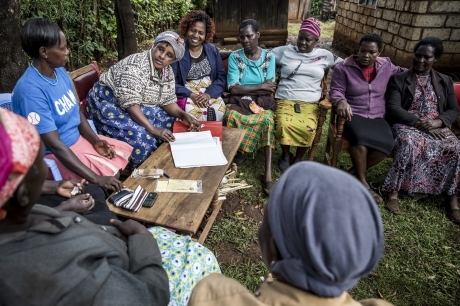 Lucy (centre) and other farmers from her group during a meeting. Working as a group enables them to sell their crops for a better profit (left). FAO is helping farmers across eight counties to have better harvests by training them to use conservation agriculture in the context of good agronomic management practices, including: planting drought tolerant crops and adapted varieties, using certified seeds, planting on time, applying fertilisers correctly, and improving post-harvest storage. To date, more than 26,000 farmers are applying conservation agriculture. FAO aims to work with county governments to expand the use of conservation agriculture practices to at least 10 percent of Kenya’s farming population. To reach the farmers, FAO has been working with community-based agricultural extension service workers, training 1,700 workers since 2014. FAO is also training women farmers to have better access to information and markets so that they can sell their crops for a better price and become more self-sufficient. As a secretary of her group, Lucy played a key role in helping her group make their products more profitable. With support from FAO, some 30,000 farmers receive support through the value chain from research and financial institutions, seed companies, fertiliser providers and sector service providers. “I have planted sorghum, beans, maize and peanuts on a leased farm. In the previous season, I planted one acre of sorghum but this season I have increased it to two acres because it brings me better earnings. Because of the contract we have with the supplier, I can budget and plan how to use my money. Many farmers can now build better houses, and some bought Toggen goats, which is a worthwhile investment as these goats give a lot of milk. We call them the ‘dairy goats’,” explains Lucy. Although many farmers are still reliant on maize, Kenya’s leading cash crop, maize production has been dropping due to more frequent droughts, and an increasing number of farmers are seeing the benefits of growing other crops such as sorghum. Lucy and her group now fetch close to $4 dollars per kilo of sorghum. They deduct a small percentage for transport and logistics costs, but the price remains competitive as local prices were below $3 in the past. Working in a group ensures that they can supply bigger volumes of sorghum, and share overhead costs as a group. They also support each other, and can learn from one another. As a result, the group keeps growing – from 36 members during the last season to 50. Lucy is seeing the benefits of her group for herself – with the money she saved, she is planning to buy a cow and is able to keep her two children in school.